All students at GAME maintains a public work blog. Register your site here. Use course code ('5SD022', '5SD013' etc) as category. Enable comments on your blog, without registration. This week i was working on the winning , Menu and Loosing screen of the game. I made a Winning screen which triggers as soon the one of the layers won the game. If player one would win then the winning screen for player one would be visible on the screen. Same for player two. The player can chose inside of the winning screen if they want to retry the game or if they want to exit the game. We planed for our game to have a 1 vs 1 local multiplayer. That means that the player fights against another player on the same device. Today i am going to talk about the Damage system i have implementet in our game. The plan was to give the sword wich the player is using for damaging the other player as soon they are in a boarding situation. I was working a lot with the blueprint system in unreal engine. Which is acctually a skripting language for devs. That means that you dont need to code everything it is a visual coding language. Iam going to talk about how i made the lightinig this week. 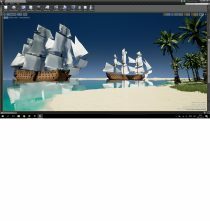 For this week i was working on the Island Environment. 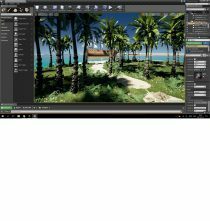 The good thing is that it is pretty easy to work with that in unreal engine. All the assets that you can see in the screenshot are free and are availible on the internet. 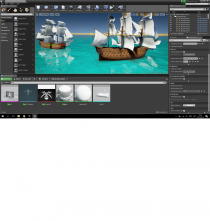 With the foilage tool the developer can add a lot of enviroment assets at once. I did not needed to handpick everything and place it inside of the engine. today iam going to talk about how i was adding the ocean to our project The Wreck deck. I was working on the ocean when i reallized that we wanted to have ocean where things can float on. There are a lot of ways you could approuch this assignment. I startet researching some turtorials on youtube and on the internet. Today i am going to talk about a thing no gamer wants to see but it is a part of every game.Yes ,you guessed right it is the one screen nobody likes.Game Over. Congratulations you loose. March 17, 2016 / Comments Off on Game??? OVER !!! today i am going to talk about what i have done since the last time i made an blog post. March 11, 2016 / Comments Off on Pause…Menu? today i want to talk about how i had implemented our second character , the president, in our game ,planet suburbia.First off i am going to give you some information about him without spoiling our story for you. give the player his/her final scoring. That is our main function for our President right now.